Spherical Plain Bearing GE.FO 2RS Series is an important part of contemporary machinery. Its main function is to support the mechanical rotating body, reduce the friction coefficient during its movement, and ensure its rotation accuracy. It achieves high strength and high precision. It can be used under special conditions such as acid resistance and water resistance. Because of its high mechanical strength and large load capacity, it is widely used in food processing, medical machinery, and pharmaceutical machinery. Spherical Plain Bearing GE.FO 2RS Series has a better sealing effect, preventing both large particle contaminants and small particle contaminants. It has a longer life and reduces maintenance requirements. 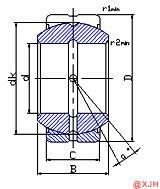 Its geometrical dimensions make it an alternative to maintainable large spherical plain bearings without seals. 6) Properties: Heavy duty, good wearability, corrosion resistance, self-alignment, dust proof.